Summer themed Tropical Passion Fruit Sangria. An easy white sangria made with white wine, rum, pineapple, orange, mango, lychee and a passion fruit syrup. The warm summer weather has me craving more drinks and cocktails, which has lead to plenty of recipes here on the blog. On top of that, my recipe offerings for this was severely limited until recently. This Tropical Passion Fruit Sangria is a new favorite of mine and a fresh, summer-themed addition to my current list of drinks. Having family in Kauai, passion fruit has become a favorite of ours. Tropical fruit has a distinct tart and sweet flavor. It can be difficult to find in the mainland, especially year-round. 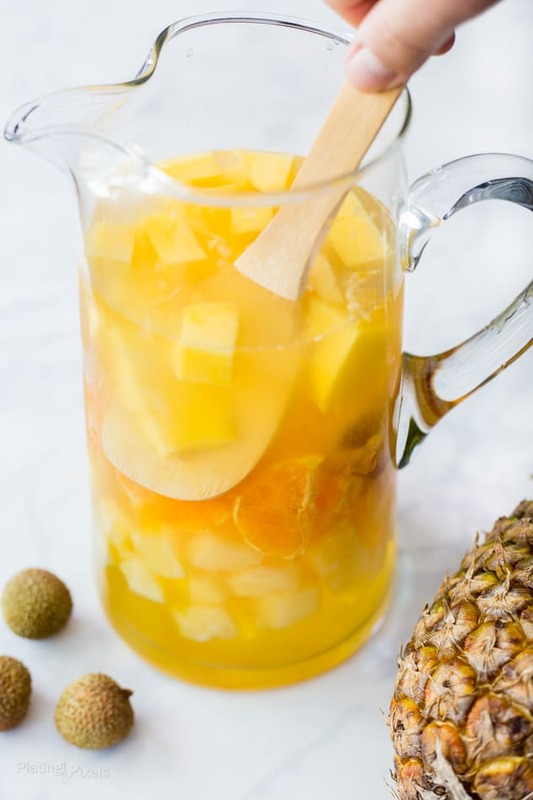 If you’re lucky enough to find it, then it’s a great fresh addition to this Tropical Passion Fruit Sangria. 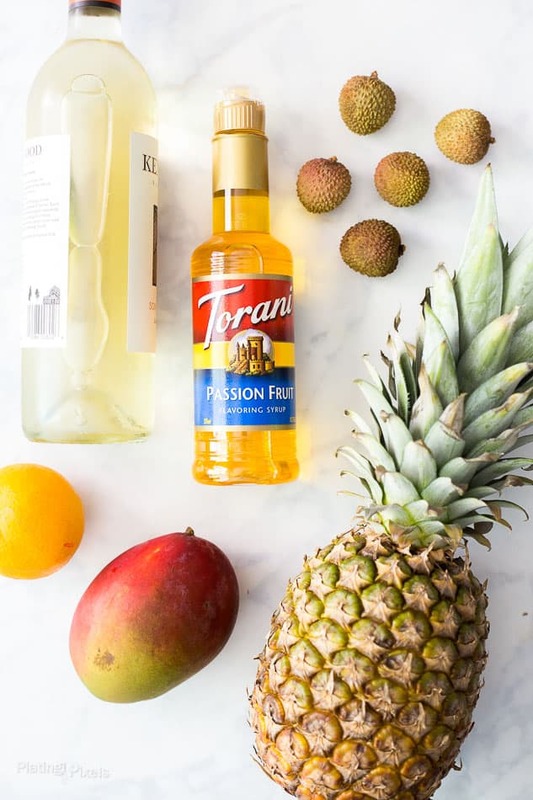 Otherwise you can use Torani Passion Fruit syrup. The new summer flavors of passion fruit, peach or raspberry are available in the tea aisle of Walmart. The unique syrups are a versatile way to add flavor to any drink. They’re made without corn syrup and include real sugar and natural flavors. I’m always on the lookout for anything passion fruit. Everything from pastries, jams, butters and now syrups are a fun way to enjoy the flavor. 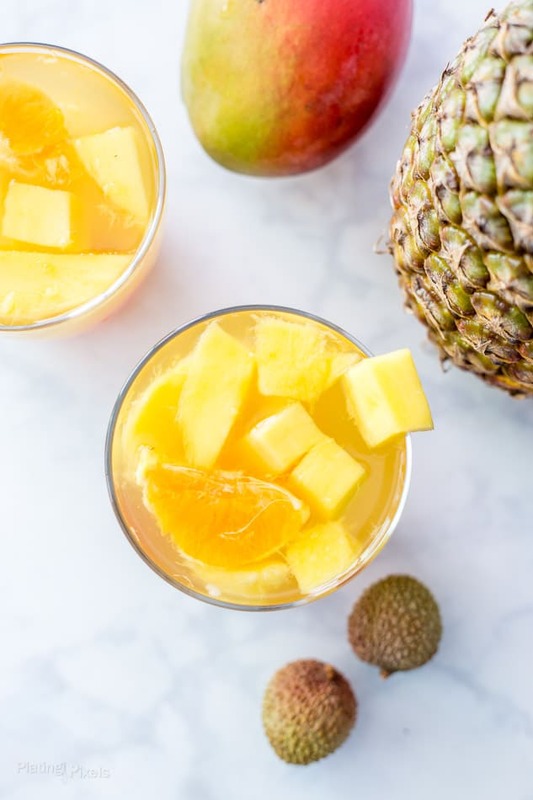 This Tropical Passion Fruit Sangria is simple to make, with only minutes of prep. Simply combine white wine, rum, pineapple juice and passion fruit syrup in a pitcher. Then add any tropical fruit, such as pineapple, mango, lychee, kiwi or banana. Chill until cold and serve at your next summer gathering. Are you following me on Instagram, Pinterest, Facebook, and Twitter? Also sign up for our newsletter to get all our recipes and cooking tips. An easy white sangria made with white wine, rum, pineapple, orange, mango, lychee and a passion fruit syrup. Place wine, diced pineapple with juice, syrup and rum in a large pitcher. Stir until combined. Add lychee, orange and mango. Cover and chill until cold—a few hours or overnight. Serve with cherry or other fruit as garnish.